We talk about transit all the time around here. We talk about why it’s annoying, why it’s convenient, subway ads, squeaky escalators, why it’s inconvenient, what we need, what we should change. This isn’t exclusively a contemporary phenomenon either, we’ve been talking about transit in this city since this has been a city. There are lots of things to explore in Toronto transit history, but allow me to zero in on the storied saga of one vital artery that has always pumped in and out of downtown T.O. Spadina Avenue was one of the first streets serviced by public transit. 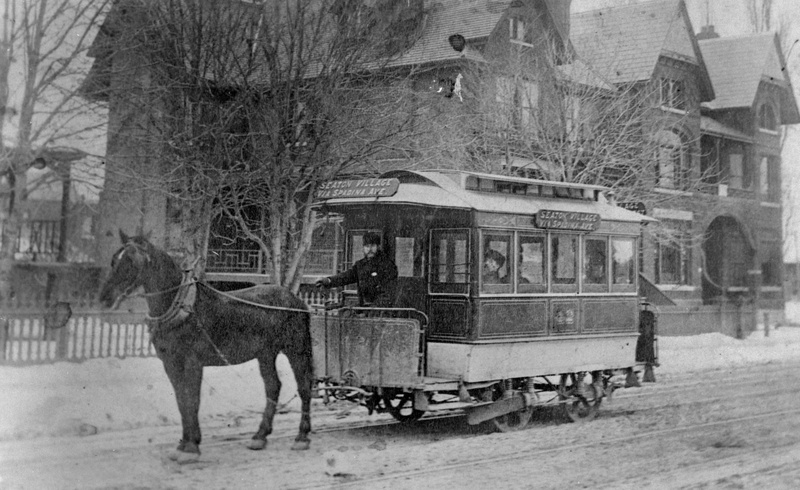 The Toronto Transit Commission’s predecessor, the Toronto Railway Company, set up street rail lines for horse-drawn cars in 1878 and electrical streetcars starting in 1892. The rail lines soon formed what became known as “The Belt Line”, a route that followed Spadina, Bloor, Sherbourne, and King to make a big “belt” around the entire city. When the TTC took over from the TRC in 1921, they embarked on huge projects to ensure the tracks for the Spadina cars were updated and kept in good running condition, because it was such an important connection to and from downtown. This streetcar line was actually really pretty in the early years of the 1900s. Further south the rail lines were tree lined, and the relative lack of street traffic really makes the Spadina car look like one of those monorails or trolleys that travels through theme parks. Unfortunately as the city infrastructure continued to expand, and the face of transit changed over the course of many decades and two world wars, and also as the debate over subways (which were first built in London, Paris, and New York around the turn of the 20th century) began to rear its sleek, industrial head, the Spadina streetcar must have heard the first knell in the distance. Chapter 3: Streetcars again, anyone? Anyone? While the golden age of the Spadina bus produced arguably the best Canadian song ever made, it had its issues by the 1970s. 6,000 people rode the bus southbound during the peak morning hours, and it took 20 minutes to travel just from Bloor to King, which was cited as an unreasonably long time. Not only was the bus itself struggling, but the Yonge St. subway line was built in 1954 followed by the Bloor Danforth line in 1966, so it looked like the city was permanently headed in the direction of rapid underground transit as it’s main downtown vehicle for shuttling the masses. Things weren’t looking so good for the future of the Spadina streetcar. However, the problem with subways is that they are such time and cash consuming projects. I mean, you literally have to rip up entire streets, bore giant tunnels, do all the track laying and electrical work, and rebuild the road on top of it all. While a more comprehensive subway system would have been ideal, an undertaking like that was not taken lightly or quickly, so more above ground alternatives had to be explored to relieve transit pressure in the shorter term. The TTC made an announcement in 1972 that light rail transit streetcars were the way of the future (despite also kind of being a way of the past) and were going to be a large and integral part of the transit system indefinitely. From the still-warm ashes, a streetcar bell dinged. 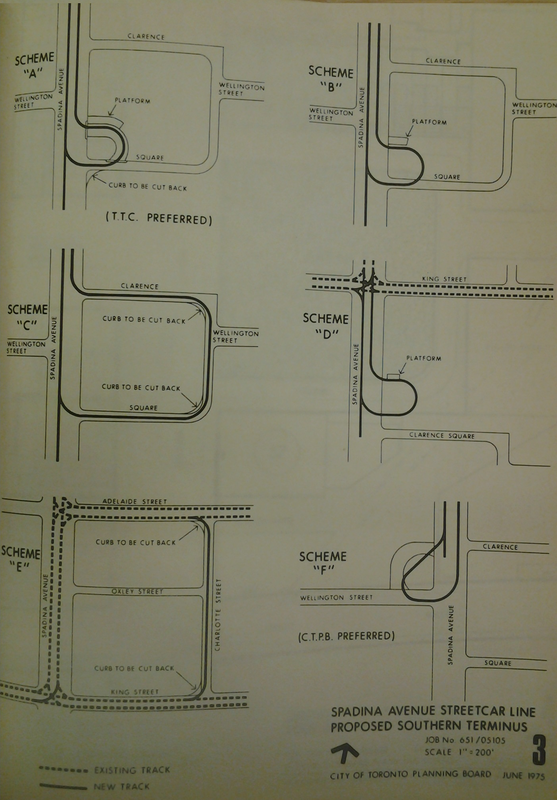 A new (but also kind of old) proposal for a Spadina LRT line was put forward in 1973, and was “approved in principle” in 1975, pending the clarification of a couple small issues, primarily the southern terminus of the route. This may be one of those times where an image I find interesting is objectively not that interesting. If this one had gone through, Clarence Square (at Wellington & Spadina) would have had a nice little streetcar loop of its own. Actually, a big part of the reason that 1975 plan didn’t fly was because the residents in that area strongly objected to having a loop go through their local park. 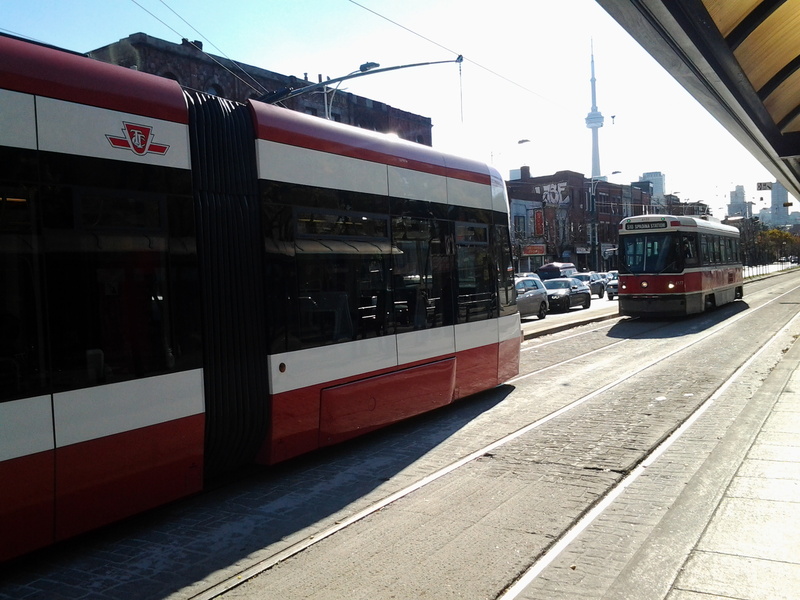 So the Spadina streetcar breathed a frustrated sigh, and continued to bide its time until its return. Chapter 3.5: Streecars again, everyone! Everyone! The streetcar sensation soon sparked to a start and surged slowly but surely into the late 1980s, but even though it finally got the green light, these things take time. The new plan was brought to the table in 1987 and was followed by hundreds and hundreds of pages of amended proposals, community impact studies, environmental assessments, more amended proposals, proposed amendments, impact proposal assessment studies, amended community environments, etc. I may have made those last few up, but there were a lot of studies. And paperwork. And city planning jargon. This is not a valid comparison at all, but the entire nation of Germany found the time to tear down the Berlin wall and reunite its whole country while Toronto figured out if this one single streetcar line, which was previously a good idea, was still a good idea. 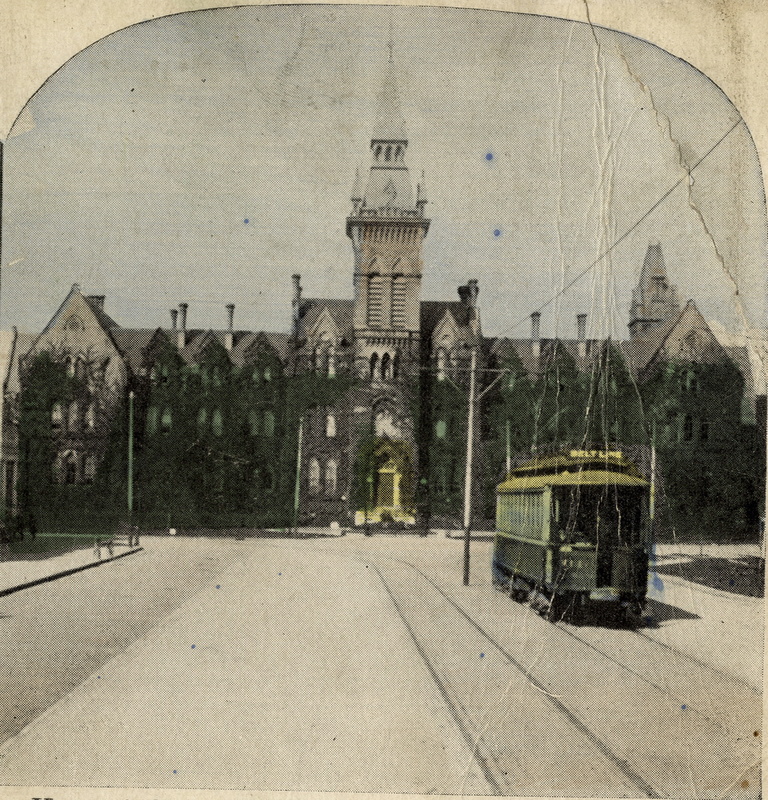 The Spadina streetcars as we know them today, in all their glory. So, at long last, the new, new plan was finally and officially approved in 1992, and after another long wait to construct the streetcar only lanes, they finally got back on the tracks in 1997 as we know them today. Now some still argue that streetcars in general are not the smartest solution to our transit woes. I argue that while it can be frustrating to wait on College for 25 minutes before seeing 4 packed streetcars arrive back to back to back, my fellow fashionistas and fashionistos would agree that sometimes you have to sacrifice comfort and efficiency for style and charm. By the way, Spadina is still keeping up its trendsetting ways, as the 510 Spadina became the first TTC route to run the new fancy LRT streetcars in 2014, bringing the Spadina Subway Saga full sircle circle. Researching the history of the TTC can be an irksome endeavor. It’s kind of comparable to looking up past draft picks for your favourite hockey team and finding out that in 1988 they passed on picking a perennial all star and instead picked someone who didn’t quite pan out. Or to finding out your favourite store had an 80% off sale on everything in the store for 6 months last year, but you didn’t realize it until today. In 2014 we’re experiencing stifled streets and what feels like unprecedentedly old and clumsy transit as if it’s a surprising problem, but keep in mind that mayors were campaigning on a pro-subway platform 100 years ago, 40 years before one actually got built. Also, despite oppositional public pressure, when they built the Bloor viaduct in the 1910s they outfitted it to be able to carry a subway car underneath the road because they knew tubes were coming, even though one didn’t come across the Don Valley until the 60s. There was a proposed plan for a Queen Street subway line in 1966 that didn’t gain enough steam, while today a downtown relief line is on the tip of every Torontonian’s lips. There are so many plans that would have been so good for the city to have that were proposed over the years that were either shot down, or approved then cancelled. The point is, looking at all the “what ifs” made me think that if only a few of those city leaders had just grit their teeth and pushed through a few tough years to build more comprehensive subway lines or highways, then maybe we’d be in better shape today. The thing is, not only is that just selfish, but hindsight is always 20/20, and maybe those differences in our transit system might not have panned out well for the city long term – it’s truly impossible to tell. The only thing we can do is rest in the hope that someday, someone will come along and contribute something as valuable and lasting as this. Apparently, the right-of-way streetcar 1) actually took slightly from Bloor to King than the previous mode; 2) was set up to change the north-south lights green as streetcars approached an intersection to facilitate transit flow (other cities such as Istanbul successfully use this) – this was implemented for a brief time but there was an accident and the city got scared and turned it off. Cars 1 Transit 0. Slow 1 Rapid 0. That’s crazy. I think by now Cars and Slow are probably up by a few more points too.